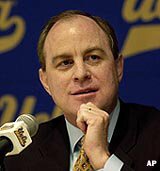 Head coach Ben Howland enters the 2005-06 basketball season with arguably his most talented and deepest squad since he joined the UCLA program two seasons ago. The Bruins are ranked 18th in preseason collegiate basketball polls even though the team begins the season with two of their starters on the injured list. Yet, the Bruin team depth is such that it may be enough to overcome the injuries during the early part of the regular season schedule. Overall team depth and talent was not a luxury Howland inherited from his predecessor. The basketball program was at a low point coming off a disasterous season with the team finishing 10-19 tied for last in the Pac-10. If the UCLA basketball program had honestly looked itself in the mirror at the time, a dynastic powerhouse which boasted 11 national championship banners hanging from its rafters, it would have seen its reputation had lost some luster. As a result, blue-chip recruits, and more importantly the local blue-chippers, were were looking at programs outside of Westwood. With his second consecutive nationally ranked recruiting class, Howland now has quality players at every position which will allow him to go 9 or perhaps 10 players deep in most games. More importantly, Howland will be able to practice his most honored theorem, "If you're too tired to defend or block-out during a game then you need to sit on the bench and we'll find someone who can do those things." The freshmen joining the UCLA program add size, speed, and athleticsm to last year's squad which lost two key seniors - Dijon Thompson and Brian Morrison. Darren Collison a 6'0 ultra quick point guard from Etiwanda High School gives the Bruins a quality back-up floor general to Jordan Farmar. Last year, the Bruin offense sputtered when Farmar went to the bench. With Collison, the Bruins have a guard who can change the pace of the game with his sheer speed, and who on occasion when paired with Jordan Farmar in the backcourt will create match-up problems for opponents. Alfred Aboya and Luc Richard Mbah a Moute, both incoming freshmen from Camaroon, give the Bruins size and athleticism inside the paint where it was sorely missed last year. Luc Richard already has shown explosiveness on both ends of the court and has shared rebounding high honors in both exhibition games. Alfred Aboya is a 6'8 wide body who Howland feels will be the best overall rebounder on the team; however, Aboya is still rehabilitating from a summer time knee surgery and is expected to debut in a couple of weeks. Sharpshooting freshman Michael Roll from Aliso Viejo knows his role on the team. Shoot when open and then shoot some more. Roll demonstrated his long distance prowess by hitting on 4 of 9 beyond the 3-point arc during exhibition games. Rebounding will need to be a strong suit for the Bruin team this year - Coach Howland expects the Bruins to run the fast break at every opporuntiy. And the only way the Bruins will be able to run effectively is if they rebound effectively on the defensive end. While Ryan Hollins and Michael Fey are both 7-foot seniors - they have never consistently rebounded well; however, Bozeman and Luc Richard, although only 6'6-6'7, have been quick to the ball and have shown good rebounding instincts during exhibition games. Add Alfred Aboya, all 6-8 242 lbs, and an ever improving Lorenzo Mata - the Bruin front court should be able to provide solid rebounding to support and compliment the running game Howland envisions. Some may be surprised to find Ben Howland coaching a fast break running offense especially considering he coached bruising Pitt teams out in the Big East, but Howland has shown he can change his offensive strategies and schemes to fit his personnel. Last year's Bruins offense was dominated by its perimeter players - led by Dijon Thompson, and even though the 05-06 squad is more balanced due to the addition of quality frontcourt recruits (Mbah a Moute and Aboya), the perimeter remains the focal point of the offense for this team. With Farmar orchestrating the offense from the point, his lightening quick protege - Darren Collinson running the break, and sophmore swingman Arron Afflalo streaking down on the wings, the Bruins will look to score as many points on fastbreaks rather than relying on their half court sets. Fifth-year senior Cedric Bozeman, along with seniors Fey and Hollins, should provide the Bruins with much needed leadership especially when the Pac-10 season begins in December. Bozeman appears to have fully healed from his season ending knee injury last year, he has played well at the forward spot during exhibition games and even led the offense at times during the game. Returning starter sophmore Josh Shipp begins the season on the injured list as he recovers from offseason hip surgery and is not scheduled to return until at least midseason. Prior to his surgery, Howland felt that of all the returning players last year he thought Shipp had improved the most during the summer, in addition, Shipp has added 20 pounds of muscle to his frame. The Bruins open the regular season tomorrow (11/15/05) at home in the first round of the NIT Season Tip-Off tournament against New Mexico State. If the Bruins win against the Aggies, then it more than likely sets up a second round game against John Chaney's Temple Owls on Thursday (11/17/05) at Pauley.